The Limiting Oxygen Index (LOI) fire test is perhaps the most economical and precise quality control test for combustible materials. Its ease of use together with high levels of precision has made this technique a primary characterization and quality control tool for the plastic materials and electric cable industries. It is often used in materials specifications and material/product data sheets and included in some US Mil Specs. The test assesses the minimum percentage of oxygen in the test atmosphere that is required to marginally support combustion. The unit has been designed to be compact for efficient use in a standard fume cupboard (or under a simple ventilation hood that we can also supply if required). The unit gives continuous digital readout of oxygen concentrations in the test atmosphere to facilitate quick settings of test concentration. Stabilised oxygen percentages are read from the digital readout and no additional flow adjustments are required. This is a considerable improvement over systems that use analogue gauges or require flow matching and the use of graphs or tables to calculate oxygen concentrations. This makes the unit as automatic as is feasible. 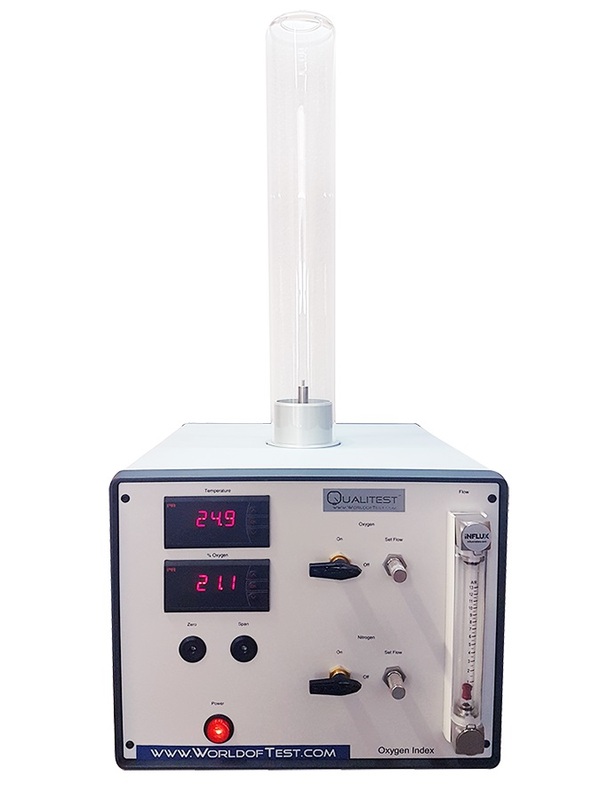 While many designs of the LOI test apparatus calculate oxygen index based on the flow of oxygen and nitrogen, the unit incorporates a paramagnetic oxygen analyzer for precise measurement of oxygen concentration without the need for calculations and frequent recalibrations. Paramagnetic Oxygen Analyzer for assessing accurate oxygen (± 0.1%) levels. Automatic flow control gives oxygen level adjustment by turning one single valve. Digital display of oxygen percentage in atmosphere during test (no calculations needed). Digital display of temperature of gas mixture entering the test chimney. Quick loading of sample into test chimney. Sample holders for both rigid and flexible samples supplied. One pack of 10 clear PMMA calibration samples (Oxygen Index: 17.4) supplied. 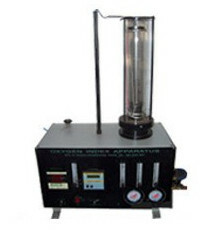 The Limiting Oxygen Index Apparatus is used to determine the minimum oxygen in a flowing mixture of oxygen and nitrogen for flaming combustion. The oxygen tester is used to check combustion of plastic materials such as polymers, cables, rubber, nylon, laminates, fabrics etc. The percentage of Oxygen required for specimen to burn without any existence of flame is displaced digitally with the help of Paramagnetic Oxygen sensor and analyzer. % limiting oxygen value is displayed with the help of digital oxygen meter. No need to calculate the limiting oxygen value by observing the volumes from the gas flow meter.